An address label-printing option is available on the Communication page in all modules. In this article we'll be in the Address Book > Communication page, but the principle is the same whichever module you are wanting to work in for producing address labels. If you have enabled the optional "Receive post" communication setting in either the Address Book or Children module, ChurchSuite will, by default, respect the "Receive post" communication settings of each selected person for whom you are producing labels. Consequently, if a person is opted out of receiving post, no label will be produced for that person - ChurchSuite respects communication preferences in all communications. However, to produce labels that override those communication settings, be sure to untick the "Respect Communication settings" option when generating labels. Go to "Address Book" > "Communication". At the top of the page, select the contacts that you wish to print labels for. By default the search box lists your contacts. You can also switch to listing tags in order to produce labels for contacts in one or more of your tags. Note that you can "Select all", or select individuals from the list, or filter the list for a selection (e.g. typing "John" will shorten the list to all contacts that include the phrase 'John' in the first or last name). Clicking the ? in the "Search" box provides a list of shortcut commands that you can type in the search box. For example, typing tag: gives a simple list of your tags. 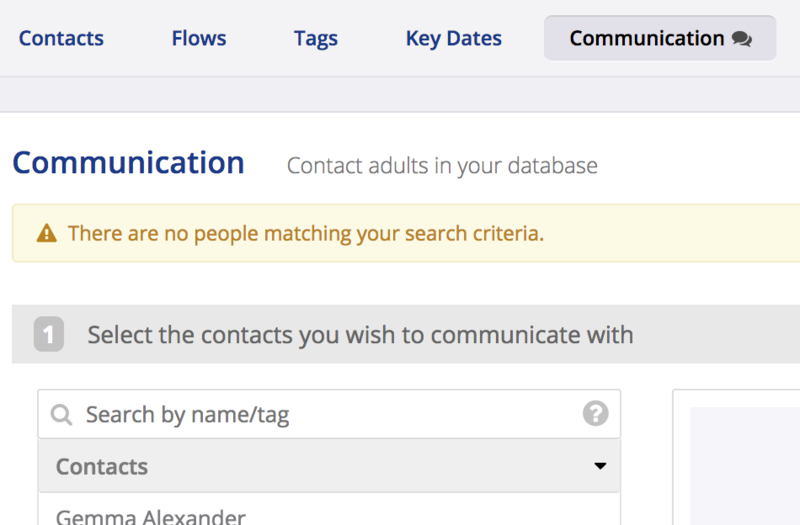 When working with tags, you have the option to match or not match against multiple tags, and whether the resulting matched contacts should match "all" tags (a more restricted results list), or "any [one]" tag (a more inclusive results list). Click "Apply tags" to selecting the matching contacts. Finally, select which label format you wish to print to. Note the additional printing options such as including the Title field or using Formal Name (if these optional fields are enabled in the module's settings). 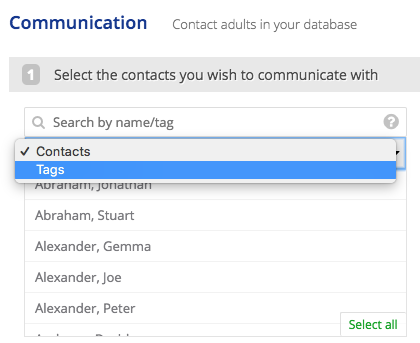 You can also select whether your labels should be logged in the Communication log for each contacts label that you produce - ideal for logging when a letter was sent. Finally, note the " Respect Communication settings" option. By default, ChurchSuite always respect communication preferences. Address labels will only be produced for those who communication preferences are opted in to "Receive post"; otherwise no label is produced for that person. You can untick the option to override/disregard communication preferences if you wish. The Address Book is not the only module that has a "Communication" page - other modules including as "Children", "Small Groups", "Rotas" and "Giving" have a Communication menu too. So, for example, if you go to "Small Groups" > "Communication", you could follow the exact same procedure above in order to produce labels and send letters to all your small group members, or just those in specific small groups, or just those in specific small group roles such as the "Leader" role. The Calendar module does not have a "Communication" section as there's no need for printing address labels in that module; however, you can still print "badges" for event sign-ups. The label size for event sign-up badges is set in the Calendar module options. Once set, you can use the "Print badges" option at the top of the list of sign-ups on the event's page in the Calendar module. The "Avery" label formats are label paper that you can buy for a normal, A4 or Letter printer. The "Envelope" formats are for printing addresses directly onto envelopes. Some printers support this functionality, but it does depend on the printer. The "Brother" label types are for the specific Brother label printers that ChurchSuite supports - currently these are the older QL-570, QL-710 and QL-720 models (no longer available), and the newer QL-700,& QL-800, QL-810W and QL-820NWB models. 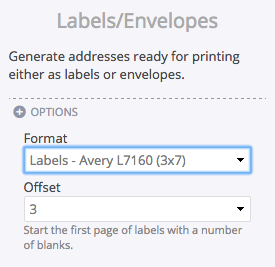 When printing Avery labels, there is an additional option to specify a label offset, which determines the number of blank labels to skip before your labels begin to print. Now you can redeem all those part-used sheets of labels in your stationery cupboard! When you are ready to print, click "Generate labels". 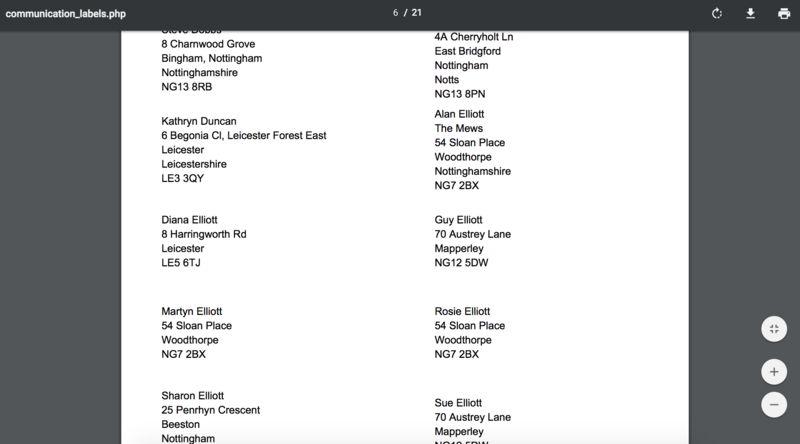 A PDF preview of your labels is now generated, which you can download or print direct from your browser.